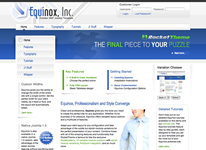 RocketTheme have released Equinox; a business orientated design for October. They say it's a business orientated design, I say with the features and flexibility it can likely be used on any type of site. The theme package consists of everything you'd expect and there is also a native 1.5 Joomla themes package if you're playing with the latest 1.5 release candidate. It's no good me telling you about RocketTheme if you're already a member as you will be full aware of all the benefits but if you're not you really have are missing an opportunity. Head on over to RocketTheme to see more of what is available including some of the best themes for Joomla ever released.